Never miss a post! Like us on Facebook and follow us onTwitter and Pinterest! 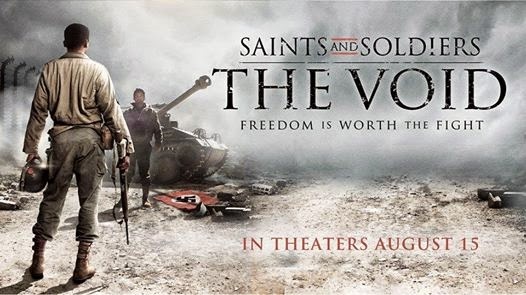 Like the tanks that figure so prominently in its plot, Saints and Soldiers: The Void lumbers along in need of a tuneup but nevertheless packs a wallop when it counts. 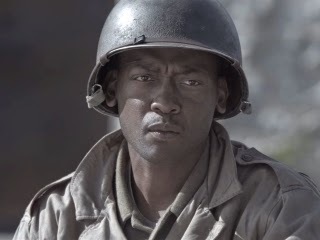 The third film in writer-director Ryan Little's ongoing WWII series (each one a standalone story) features a black soldier battling both Nazi enemies and American prejudice at the close of the war. The film's good intentions are diluted somewhat by a meandering screenplay, too many one-dimensional characters, an overload of expository dialogue, and supporting actors who fail to convey the necessary urgency. Thankfully, the central performances are all good, especially by K. Danor Gerald in the lead role, as well as Studio C's Matt Meese in a dramatic turn that proves he's got broader range than expected. The opening credits, a combination of newsreel footage and aggressive animation, are quite impressive. Director Little continues to display a talent for action sequences as well as quiet, intimate moments of decency. With a bit more focus in the storytelling and polish in the casting this could have been as excellent as the first Saints and Soldiers (2003). As it is, The Void is still worth a watch. 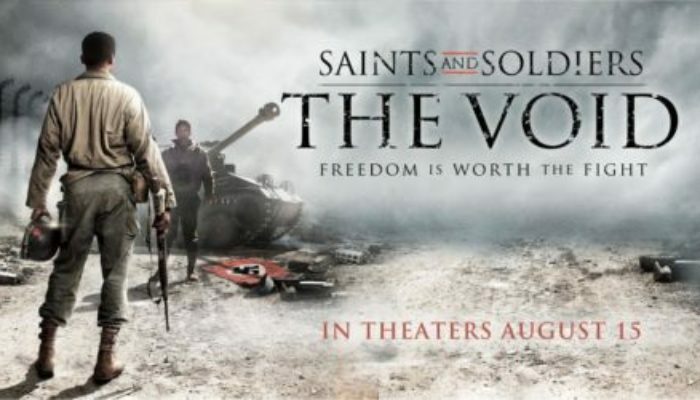 CONTENT OVERVIEW: Saints and Soldiers- The Void is rated PG-13. There are a couple of very mild profanities, a flatulence gag, and one use of the “n-word” (used to display the bigotry of one soldier). There is no sexuality. A few characters drink from a flask. There is plenty of war violence, but most of it is bloodless and none of it is gratuitous. The film is appropriate for young teens and up. MESSAGES TO DISCUSS: “All are alike unto God…black and white, bond and free, male and female…Jew and Gentile” (2 Nephi 26:33, The Book of Mormon). “Racial prejudice is of the devil. Racial prejudice is of ignorance. There is no place for it in the gospel of Jesus Christ” (The Teachings of Spencer W. Kimball, p. 237). “Thus saith the Lord: ye shall not esteem one flesh above the other, or one man shall not think himself above the other” (Mosiah 23:7, The Book of Mormon). “No man who makes disparaging remarks concerning those of another race can consider himself a true disciple of Christ. Nor can he consider himself to be in harmony with the teachings of the Church of Christ... Let us all recognize that each of us is a son or daughter of our Father in Heaven, who loves all of His children. Brethren, there is no basis for racial hatred among the priesthood of this Church. If any within the sound of my voice is inclined to indulge in this, then let him go before the Lord and ask for forgiveness and be no more involved in such.” (President Gordon B. Hinckley, “The Need For Greater Kindness” April 2006 General Conference). “Race and the Priesthood” – From the official web site of The Church of Jesus Christ of Latter-day Saints (2013). “Race in Mormon History” – My own attempt to explore the Church's history and doctrine in Meridian Magazine (2012). A few of my conclusions are superseded by the above document, but the research is still relevant and, I believe, insightful.